Cathi Graham wrote The Fresh Start Thermogenic Diet after she achieved one of the largest weight losses ever to be recorded in Canada. In 1982 she weighed 326 pounds and when her doctor declared her morbidly obese. This was the shock necessary to spur her to action. She began to research weight loss methods and discovered thermogenic foods, which increase metabolism, reduce appetite, and boost energy. She lost 186 pounds within 18 months by following the principles outlined in her plan and has managed to keep the weight off for over 20 years. The basic idea of the diet is to restrict carbohydrates to some degree while emphasizing low glycemic sources and at the same time to increase the intake of specific thermogenic foods. There is a large emphasis on improving the function of the digestive system so that weight loss is easier to achieve. Avoiding high glycemic index foods and taking supplemental digestive enzymes facilitate this process. Dieters are provided with an option of either a diet that severely limits carbohydrates called the “Carbo Cleanout Plan” or one that includes moderate amounts of low glycemic carbohydrates and whole grains which is called the “Glycemic Plan”. Both plans allow for a small dessert daily however alcohol is not allowed for at least the first few weeks of the plans. Low glycemic index foods such as lean proteins, seafood, eggs, cheese, nuts and seeds, most vegetables, fruits, and certain grains such as quinoa and brown rice. Thermogenic foods which include garlic, chili, apple cider vinegar, celery, cinnamon, mustard, parsley, ginger, turmeric, salmon, tuna, and green tea. In The Thermogenic Weight loss program Dieters are encouraged to engage in aerobic exercise 5-6 days per week for 30-45 minutes. Resistance exercises are also recommended for 20 minutes three times per week. 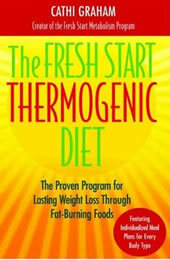 The Fresh Start Thermogenic Diet retails at $24.95. Several supplements are recommended which will increase the cost of following the diet as prescribed. Promotes a wide range of unprocessed whole foods. Dieters have a choice of two different plans. Additional recipes are available through the author’s website or in several available recipe books. Some flexibility is given with a small daily dessert, which may help with adherence to the plan. Addresses the issue of emotional eating. The author’s personal success story along with that of many others who have lost weight on the diet is very inspiring. Very restrictive and entire food groups are severely limited. Some healthy foods such as certain fruits and whole grains are eliminated. The “Carbo Cleanout Plan” is very low in carbohydrates, which may leave many dieters feeling hungry and fatigued. Meal plans do not take into account individual energy requirements. Does not provide sufficient information for maintaining weight loss once the goal weight is achieved. Supplements are recommended as part of the plan, which may increase expense and will not necessarily increase effectiveness in regard to weight loss. Author is not a trained nutrition or health expert. Additional online materials may be expensive. Although there is some research that validates the possible effects of thermogenic foods for weight loss their role as the major element in a successful weight loss plan is debatable. It is probably more likely that any success that occurs on this plan is due to the dramatic overhaul of diet and lifestyle that is necessary if dieters adhere to the plan as outlined. Disciplined dieters will very likely be rewarded with relatively fast results on The Thermogenic Weight Loss Plan, particularly the more restrictive “Carbo Cleanout Plan”, however, it will be necessary to exercise caution when reintroducing foods so as to maintain the weight loss.